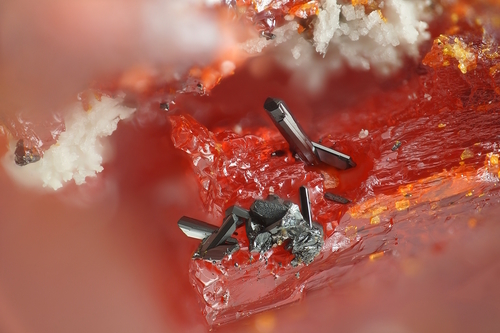 Parapierrotite: Mineral information, data and localities. Some Sb may be replaced by As (note that pierrotite has a much higher As content). 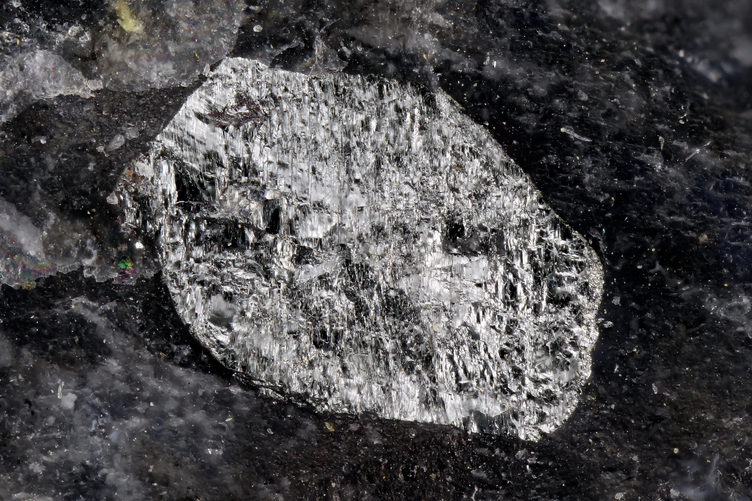 Named for close relation to pierrotite, which was named after Roland Pierrot (1930-1998). Prismatic crystals, also laths and grains. Good basal cleavage (or parting? ), and possible poorer cleavage in other directions (see: http://www.mindat.org/photo-340631.html and other photos). The original description incorrectly says that no cleavage was observed. Graph shows reflectance levels at different wavelengths (in nm). Top of box is 100%. Peak reflectance is 0%. Chert 23 photos of Parapierrotite associated with Chert on mindat.org. Arseniosiderite 7 photos of Parapierrotite associated with Arseniosiderite on mindat.org. Tripuhyite 7 photos of Parapierrotite associated with Tripuhyite on mindat.org. Weissbergite 6 photos of Parapierrotite associated with Weissbergite on mindat.org. Quartz 5 photos of Parapierrotite associated with Quartz on mindat.org. Kermesite 5 photos of Parapierrotite associated with Kermesite on mindat.org. Hematite 5 photos of Parapierrotite associated with Hematite on mindat.org. Marcasite 5 photos of Parapierrotite associated with Marcasite on mindat.org. Chalcedony 4 photos of Parapierrotite associated with Chalcedony on mindat.org. Realgar 3 photos of Parapierrotite associated with Realgar on mindat.org. Contains thallium - always wash hands after handling. Avoid inhaling dust when handling or breaking. Never lick or ingest. 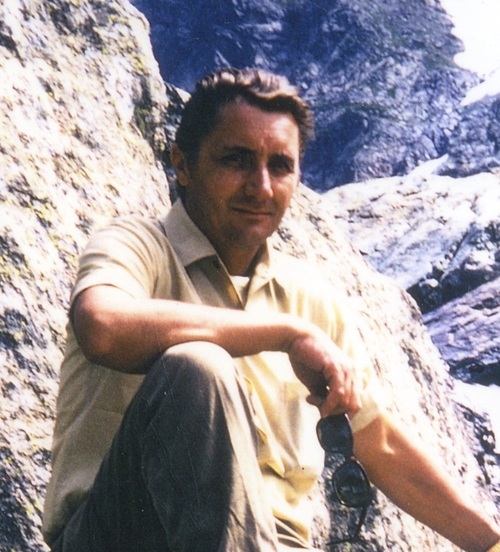 John, Z., Picot, P., Hak, J., Kvaček, M. (1975): La parapierrotite, un nouveau minéral thallifère d'Allchar (Yougoslavie). 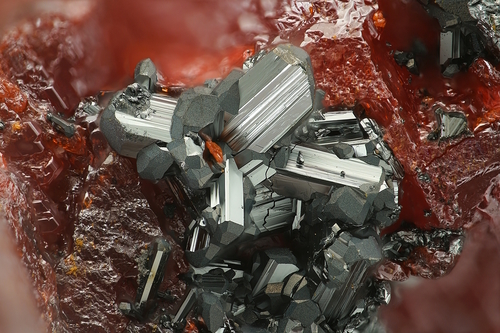 Tschermaks Mineralogische und Petrographische Mitteilungen 22, 200-210. Engel, P. (1980): Die Kristallstruktur von synthetischem Parapierrotit, TlSb5S8. Zeitschrift für Kristallographie 151, 203-216. Plášil, J., Kasatkin, A. V., Škoda, R., Stepanov, S. Yu. (2018): Parapierrotite from the Vorontsovskoe gold deposit, Northern Urals, Russia: crystal structure and chemical composition. Zapiski RMO 141, 68-77. M. Bonnemaison, J. Delair, F. Tollon, Chron. Rech. Min., N° 486, 1987, pp 81-84.
http://fglb.clubdesk.ch/clubdesk/www; Raber, T. (2016): Parapierrotit. Schweizer Strahler 50 (1), 24-25. King, N. R. (2014, October). THE MINERAL ASSEMBLAGE FROM LOOKOUT PASS AREA, SHEEPROCK MOUNTAINS, TOOELE CO., UTAH. In 2014 GSA Annual Meeting in Vancouver, British Columbia.